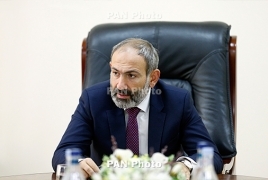 PanARMENIAN.Net - Armenian Prime Minister Nikol Pashinyan will meet the NATO Secretary General Jens Stoltenberg during his working visit to Belgium on July 11-13. While in the Belgian capital, the Armenian Prime Minister will meet the heads of EU agencies, as well as hold bilateral meetings with the heads of several state and government. As reported earlier, the PM will take part in the NATO Summit and the meeting of the heads of governments and states participating in NATO's Resolute Support mission in Afghanistan. Besides meeting the Secretary General, Pashinyan is set to deliver remarks at the summit and at an event in the Carnegie Endowment. The Armenian delegation headed by Pashinyan will include Deputy PM Mher Grigoryan, Defense Minister Davit Tonoyan and Foreign Minister Zohrab Mnatsakanyan, as well as advisor to the Prime Minister on foreign policy issues Arsen Kharatyan, Minister of Education and Science Arayik Harutyunyan, head of Armenia’s mission to NATO, ambassador Gagik Hovhannisyan and Armenian ambassador to Belgium Tatul Margaryan.